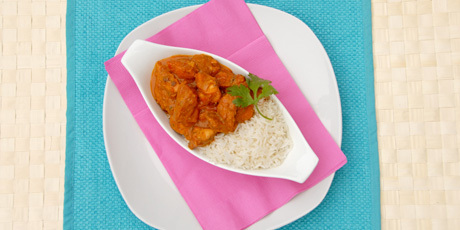 Fragrant Indian butter chicken. This recipe is divided into two parts: making the Tandoori chicken, then using the Tandoori chicken to make butter chicken! You can make the Tandoori chicken a day in advance. You might also like these Weeknight Curry Recipes. 1. Poke raw chicken thighs in several places with a fork. Place chicken in a large, heavy-duty, resealable plastic bag. Add Tandoori marinade to bag. Turn bag several times to coat chicken with marinade. Marinate chicken in refrigerator for at least 6 hours or overnight. 2. Preheat oven to 425ºF. Place chicken thighs in a single layer on a baking sheet lined with foil and bake for 20 to 25 minutes, or until cooked through. Do not overbake the chicken, or it will be dry. When cool enough to handle, cut into bite-sized pieces and add to the butter chicken sauce as directed in recipe. 1. While chicken is baking, make sauce. Melt butter in a large pot over medium heat. Add onions and garlic. Cook slowly, stirring often, until onions are tender, about 5 minutes. Add gingerroot, chili powder, turmeric, ground coriander, cinnamon and cumin. Cook 1 more minute. Add drained tomatoes, broth, brown sugar, salt and pepper. Reduce heat to low. Cover and simmer for 10 minutes, stirring occasionally. Remove from heat. 2. Transfer half the sauce to a blender and purée until smooth. Return puréed sauce to pot with remaining sauce. Mix well and return to heat. Stir in sour cream, cilantro and cashew/almond butter. Add cut-up Tandoori chicken and mix well. Cook just until chicken is hot. Serve over hot basmati rice, if desired. Tip: PC Memories of Kashmir Spicy Tandoori Sauce is perfect for this recipe. You can find almond butter and cashew butter in well-stocked grocery stores and health food stores. The only ingredients are almonds or cashews. That's it. No hydrogenated stuff, no extra weirdo ingredients that you can't even pronounce. Nut butters are a great source of protein and good fats like monounsaturated and omega-3.